As the news of the passing of a hero broke on a sad June day, the heartbreak and sadness felt by many of us had to be tempered by the stoical sense of realism in the knowledge that a critically ill man, who had dedicated the greater part of his life to being one of the ‘greatest’ men the world has ever seen, could finally find rest. Muhammad Ali was an international figure, loved by most, admired by even those who opposed and fought him. In his life and even in his death, he impacted the world and set the tone for being a citizen of the world for all generations. While his passing had been expected for a long time coming, the loss of this great man, athlete and icon was one that those who loved him were still unprepared for. As I watch all the accolades from world leaders and ordinary folk on TV celebrating Muhammad Ali’s life and legacy, I also reflect on the key lessons that his life and example offers me as a person. At the peak of his career, Muhammad Ali delighted audiences with his charisma, over abundant skills and humour but Parkinson’s disease subsequently rendered him virtually powerless and robbed this most verbose and loquacious of men his physical co-ordination and speech. However no matter how bad his illness got, his dignity never failed to shine through. Muhammad Ali was born Cassius Clay. He began to box at the age of 12 after an incident in which his bike was stolen. Hurt by the theft, he vowed to “whup” whoever stole his bike. A local policeman cautioned him and advised him to “learn how to box” before carrying out his threat. Within weeks he trained, boxed and won fights. He had 108 successful amateur bouts before his 18th birthday and in 1960 Cassius Clay won the Olympic boxing gold medal in Rome. Due to the segregation of blacks in Southern America during that time, Cassius was refused service at a local restaurant despite his Olympic achievement. This fuelled his ambition to succeed and reach out to minorities. The ultimate glory came when, against the odds, he defeated Sonny Liston to emerge heavyweight champion of the world in 1964. While training for that title bout, he announced to the world that he was a member of the Nation of Islam and that his name was Cassius X, latter to be changed to Muhammad Ali. The response to this news was negative but it never stopped him from sticking to his beliefs or even joking about it. Whenever he was asked about his attachment to Islam, Ali joked that he was “going to have four wives: one to shine his shoes, one to feed him grapes, one to rub oil on his muscles and… one named Peaches.” In 1967, as the Vietnam War was escalating, Ali was called up for induction into the armed services. He refused on the ground of religious belief. Typically in a joking manner he said “I done wrestled with an alligator; I done tussled with a whale; Clean out my cell and take my tail to jail; ‘Cause better to be in jail fed than to be in Vietnam dead” and latter he declared “I ain’t got no quarrel with them Vietcong”. The national anger over the last comment combined with Ali’s refusal to go into the armed services caused the authorities to cancel his boxing license. He was convicted, stripped of his championship title, his passport confiscated and he faced a five-year prison term. Eventually after two-and-a-half years, the Supreme Court reversed his conviction and restored his license. This action elevated him into a champion even more than before because he was the first national figure to speak out against the war in Vietnam. Among the highlights of his career was the ‘rumble in the jungle’, the fight between him and the fearsome champion George Foreman in Kinshasa, Zaire. Before the match, in his usual boastful manner, Ali predicted “To prove I’m great, he will fall in eight”. And true to his word in the eighth round Foreman was knocked out. 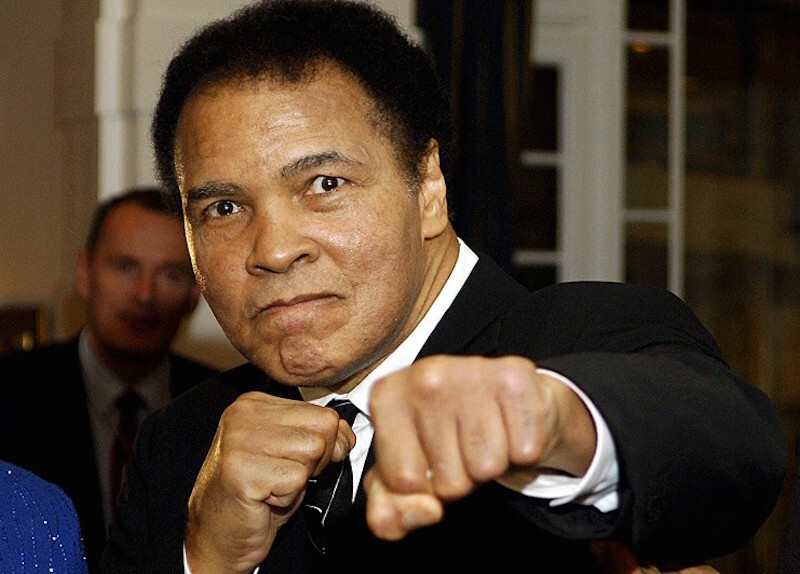 To his credit, Ali became the first man to win the world heavyweight title three times. He revolutionised boxing by pioneering a style that went against many of the game’s consecrated traditions. By the end of his career, Ali had fought an impressive 61 bouts with 56 wins (37 by knockout) and 5 defeats (1 knockout). Shortly after his retirement, he was diagnosed with Parkinson’s disease and has been battling it ever since. Before Muhammed Ali started boxing, the sport was largely controlled by the mob but he came along and defended it as a sport. He gave this most uncompromising of sports beauty, grace, style, magnetism, humour, class, sheer excitement and he fought with emotions and all his heart. In his usual stubborn way, he refused to adhere to the conventional way of boxing and told the establishment “I don’t have to be what you want me to be; I’m free to be what I want”. In the ring Ali used a method that flouted boxing logic; for one he had arm reach and used it so that he didn’t get close enough for his opponent to hit him. Additionally, his powerful legs allowed him to dance, shuffle and float in the ring. The ‘Ali shuffle’, a foot manoeuvre invented by him, allowed him to elevate himself and sometimes deliver a blow while dancing. At the time when his career bloomed, boxers never talked to the media but Ali disregarded this by boasting and predicting matches in a very public, bragging and poetic manner. In a rhyme that latter came to define his mode and manner in the ring, Ali said of himself, “I float like a butterfly, I sting like a bee; his hands can’t hit what his eyes can’t see.” Floating, stinging, striking, winning or rhyming, before his death, Ali emerged as the world’s most adored athlete. His actions outside of the boxing ring continue to speak volumes. In his journey he risked everything; his standing, his title, his achievements and his livelihood, yet he managed to surface as a hero and a man of principle for all time. He always stood up for his beliefs, loved children and respected women. He was a super, super star – confident, smug and incredibly handsome. Ali will always be a great inspiration to mankind as a whole and black people in particular; we can all learn a great deal from him. He gave people hope and proved that anyone could overcome insurmountable odds to achieve their dream. After his retirement from the ring, Ali was a relentless advocate for people in need, having delivered millions of dollars in food and medical relief to third world countries and raising, in excess of, $100 million for charities throughout the world. For the last three decades the terrible disease that dogged Ali had done its share of crippling him, but he fought and refused to let it beat him. He fought Parkinson’s disease with the same courage and determination he brought to the ring and to his work aimed at alleviating poverty, hunger and intolerance. Whether one followed his career or not or agreed with his political views and lifestyle, there is no arguing the fact that Muhammad Ali was a spectacularly unique and fascinating person. For a very traditional Hausa/Fulani girl, from a rural African village in North-Western Nigeria to be so moved by him that she developed an interest in the sport of boxing says a lot about his ability to inspire from afar. Watching him perform was the most remarkable and entertaining thing ever and it was a form of expression that I immediately clung to and tried to emulate. The interest I had in the way he recited poetry led to me writing stories using the same rhyming format as he and this, invariably, led to other forms of writing. As weird as it may sound, today, I can honestly say that it is largely to Muhammad Ali’s credit that I write. Muhammad Ali’ was an incredibly remarkable personality and his story should never stop being told to generations who may not be aware of the story of this one man who was the epitome of brilliance, humour, spirit and will power. He had a pure heart and a beautiful soul. His magic transcended sport and touched the whole world. The world is less brighter without Muhammad Ali in it. He touched the world and in return the likes of myself will always love him from the bottom of our hearts. Muhammad Ali was a personal hero to me and I, like millions across the world, loved him dearly. I thank him for representing so many things in so many people’s lives and for instilling in me the love of boxing, poetry and freestyle rhymes.